Close Read Poetry Kindergarten - 1st grade for Rhyme, Senses, and Feelings. 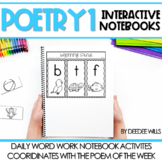 8 poems for the month of June (2 a week) A lesson plan for each day for poems. Student-friendly font that is big and easy to read. 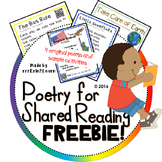 Aligned with CCSS Poetry is an essential part of learning in young students and readers! It provides opportunities to expand on rhyming, vocabulary, phonics, and more.